A minor update to the game was released today on the iOS App Store. It is likely this was just a release to fix some bugs. The only obvious difference is the load screen when switching to Krustyland has changed. 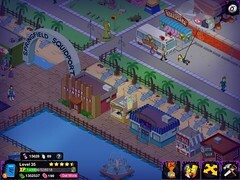 It now mimics the screen Android players have been seeing since Krustyland went live. By the end of the day you should have at least 8866 GOO to unlock all ten personal prizes. -- event ends on Nov 7th! Homer covets Moe’s emerald in this season’s Treehouse of Horrors episode. ↑ TopBlog at WordPress.com.Customized zBench Theme.